Pathways to Prosperity (P2P) has been contracted by Immigration, Refugees and Citizenship Canada (IRCC) to design, implement, and evaluate a process for identifying and sharing promising practices in settlement and integration with an empirical basis for their effectiveness. Over a two-year period, P2P will produce 25 videos and accompanying briefs on promising practices in the immigrant settlement and integration sector, targeting a range of service areas and client groups. Promising practices are practices that have an objective basis for claiming effectiveness in achieving their stated aims and that have the potential for replication. Thus, promising practices are defined in terms of their effectiveness, which can be empirically measured as successful outcomes of the practice. Our approach will focus not only on identifying truly promising practices, but on analyzing and sharing key features that can be replicated. Promising practices may have faced challenges in their initial implementation, and these challenges will also be considered and analyzed so that others can learn from these experiences. The first call for nominations was launched in January 2019 and targeted the following service areas: promoting welcoming communities; language instruction in the workplace; information and orientation; supports for youth and addressing intergenerational issues; adapting settlement services and supports for rural and remote communities; and housing supports. A total of 79 nominations were received, and 6 practices were selected for further analysis. The next call for nominations will be launched in spring / summer 2019. On November 22-23, the Pathways to Prosperity held its Sixth Annual Conference – Borders, Welcoming Communities, and the Politicization of Immigration: Challenges and Opportunities Surrounding the Dynamic Movement of People. On November 21, Pathways to Prosperity also supported a Preconference of Local Immigration Partnerships – Paving the Way for our Future: A Conference for LIP Engagement and Sustainability. The conference attracted 450 attendees and the preconference 165, with registration sold out well in advance. As we continue to grow, we thank all those who support the Pathways to Prosperity and participate in our activities. The first day of the conference began with opening remarks by Vicky Boldo of the Montreal Urban Aboriginal Community Strategy Network, and by Éric Gervais of the Ministry of Immigration, Diversity and Inclusion, Quebec. This set the tone of respect for our presence in Montreal on the unceded Indigenous lands of the Kanien’kehá:ka Nation. 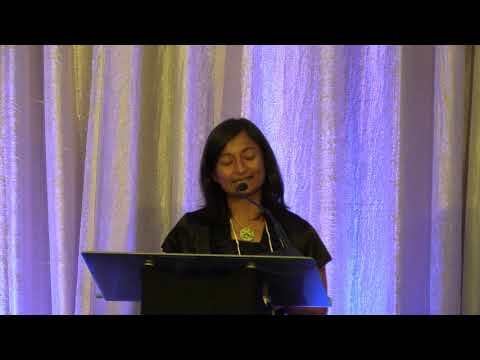 The second day of the conference kicked off with an engaging special keynote address by Sharon Bala, author of The Boat People, reminding us of the importance of story-telling in influencing public attitudes toward immigrants and immigration. The conference also included four plenary sessions on current issues, including The Politicization of Immigration, The Role of Immigration in Canada’s Labour Market, Strategizing around Refugee Claimants, and Settlement Challenges in Traditional and Non-Traditional Receiving Communities. In between, there were 29 workshops and presentations of 33 posters. Judging by the enthusiasm of participants and comments received to date, all the events were a tremendous success, featuring high quality presentations and engaging those in attendance. The preconference focused on how we can expand the LIP partnerships to include non-traditional partners, how we can work to sustain and ensure the continuity of the LIPs, how LIPs can continue to do good work on anti-discrimination and promoting welcoming communities, and, finally, on the possibility of coming together to establish a national LIP secretariat. P2P also continued the tradition of preparing a PowerPoint presentation and booklet of LIP achievements. Informal comments and feedback received to date indicate that the preconference was a great success and P2P was encouraged to continue this excellent meeting for the LIPs. In addition, the FCFA has indicated that the Réseaux en immigration francophone will rejoin the preconference next year and contribute their additional expertise and connections. We would like to thank all presenters and chairs who worked so hard to ensure that the conference and preconferences were a success. We also thank all of the exhibitors, and the sponsors for their support – World Education Services; Immigration, Refugees and Citizenship Canada; the 2019 International Metropolis Conference; and the Intercultural Competency Advantage Program of the Cross Cultural Learner Centre. In addition, this conference would not have been possible without the generous support of our main funder, the Social Sciences and Humanities Research Council of Canada. The Pathways to Prosperity Partnership (P2P) is an alliance dedicated to fostering welcoming communities that promote the economic, social and civic integration of migrants and minorities in Canada. We also help communities grow their economies, renew their populace, and reinvigorate their labour markets by fully welcoming immigrants, international students and temporary foreign workers. Two areas of special concern are Northern and rural communities, and Francophone minorities outside of Quebec. The Partnership includes all key federal and provincial migration ministries; municipalities; national, regional, and local organizations involved in newcomer settlement; and researchers from over fifty universities. The main activities of the Partnership are primary and secondary research, knowledge transfer, education, and mutual learning. Our activities are both national in scope and region-specific, with a particular focus on comparative perspectives and best practices. Our methods bring together academic scholarship with local expertise and detailed government program knowledge. This allows us to provide practical, empirically-based advice on policies, programs and agency practices.